I’m in the mood for something rich, crunchy and chocolatey. Look what I picked. 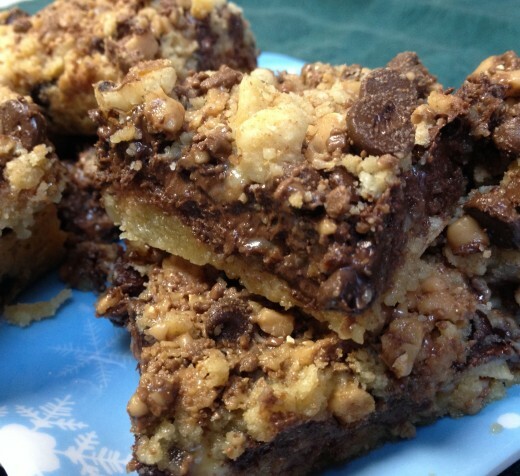 These delicious bars are one of my Mom’s recipes. Of course hers were always better, but mine came out quite tasty too. The recipe makes a 9×13 pan fun of delicious! There might be a lot of ingredients, but it is really an easy recipe to prepare. Once they are finished cooking, be sure to try one while they are still warm. Yum! The melted toffee with the melted chocolate is worth the wait. The full recipe is right here. I like to cut them into 4 or 5 inch squares and freeze some for later. If you would rather not go through them too fast, I would suggest it. They freeze beautifully. Simply wrap securely in plastic wrap, then place all the packets in a zip bag. Pull a package out when you want one. Sweet mom would keep these and several other bars in the freezer for company. On the day they were visiting she would pull out one or two of each, and cut them into one inch bites. That way her guest could try more than one kind too. They always liked that! Chocolate Chip Toffee Bars are great to serve guests—the look so pretty. But the family will love them too. Cut in bite sized pieces they are great for a great luck or buffet dessert. Lastly, don’t forget the cookie exchanges. Add them to a tray with Pecan Balls and Ginger Cookies and everyone will think they are in cookie heaven. These days with my smaller space and simpler lifestyle, I no longer use a big Kitchen Aid mixer. I was happy to pass it on to my daughter. I find a hand mixer so much lighter and easier to maneuver. I can carry it wherever I want to prep, then put it away, off the counter, in very little space. I love this one with the little canister that holds the cord and beaters. It has plenty of power to do everything. So glad I have it now. This article went ahead and made my day. Thanks so much! I wish I could come up with ideas like this one. Thanks for sharing!